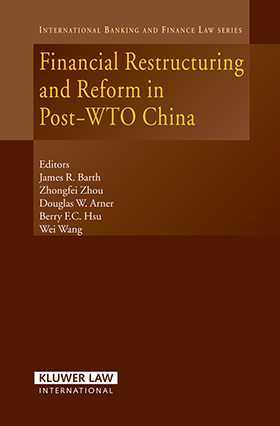 This book addresses the on-going process of financial restructuring and reform in post-WTO China from a legal perspective. Chapter 1 provides an overview of the impact of the WTO on China’s financial markets and financial law systems. Chapter 2 discusses reform of banking law and regulation in post-WTO China. Chapter 3 addresses the role of the central bank in China’s financial system, focusing on issues of independence and accountability of the People’s Banking of China (PBOC), China’s central bank. Chapter 4 analyses China’s compliance with WTO obligations in the area of banking. Chapter 5 discusses the role of asset management companies (AMCs) in China’s on-going banking restructuring and liberalization. Chapter 6 analyses the development of securities markets in China, the challenges being faced and the impact of the WTO. Chapter 7 describes insurance and its development in China, focusing on the role of the WTO in liberalization. A new topic in China, i.e., financial conglomerates, is discussed in chapter 8, building upon the discussions in the previous chapters. Chapter 9 in turn studies the issue of financial institution insolvency and restructuring as noted in previous chapters, key issues in China. Chapter 10 discusses the double impact of the WTO and one of China’s regional trade agreements, CEPA, on China’s banking law.